Welcome to ExamNotes by CertBlaster! Here we will look at some of the specific services provided by network servers and other network hosts. We will examine the purpose and properties of various servers, internet appliances and legacy systems. Specialized servers are the key to efficient web content delivery, mail, file and print services, addressing and name services and user authentication. Let’s break them down. A Web server is used by companies to deliver web based content over HTTP. This can be done privately in the case of an internally accessed company webpage, or publicly over the internet. A File server is primarily used to establish a central location where users can store and share content like documents, media files, and spreadsheets which can be stored and accessed. The computer hosting the service is attached to the local network. An NAS (Network Attached Storage) device is often used in this type of application. This is not the same as an internet based file server that uses FTP protocol or more accurately an FTP server and is accessed using FTP client software. A Print server is a network connected, shared device that manages and distributes print “jobs” to the printers it controls. The management of the jobs is accessible by users and administrators in the form of a queue that displays all jobs received by the server and their status. A User can manage their own jobs and an administrator can manage all jobs. While print servers as computers are still part of many networks, there are also stand-alone wired and wireless network based printers that contain built in print servers. A DHCP server is responsible for delivering IP addressing and related configuration information to its clients using the Dynamic Host Configuration Protocol. This service has saved countless man-hours and address duplications. The DHCP server has an address range, called a scope, assigned to it for the purposes of providing addresses to hosts without duplication along with any other necessary data like subnet masks or gateway information. These addresses are leased to the host for a predefined period of time, after which they are refreshed or renewed. A DNS server has made user interaction on the internet dramatically simpler. Its job is to translate Fully Qualified Domain Names (FQDN) into the IP addresses of the desired address. Once a server performs this translation the translation information is stored in its database for quicker access. The DNS (Dynamic Name Server) is joined to the Dynamic Name System which allows it to consult with other DNS servers when necessary. A new server will do this frequently but over time this is less frequent as it consults its local database first. A Proxy server is a dedicated computer or network device that handles all external requests made by users on the network. When the Proxy server receives a request for a webpage for example it checks its internal cache of previous requests and if found delivers the content providing improved performance. If the content is not cached the Proxy will either connect to or act as a firewall and perform private to public NAT (Network Address Translation). The Proxy is capable of masking the client IP address, blocking specified traffic and filtering out malicious traffic. A Mail server can more conceptually considered an email server as it handles email. Email is customarily sent using an email client software package that allows you to compose and send email. This same program will also check your mail server for any messages bound for you. There are two main types of mail servers, incoming and outgoing. The outgoing server will use the Simple Mail Transport Protocol (SMTP) to send traffic to other mail servers en route to the destination. Delivery to the destination client is achieved using one of two incoming server types, POP3 (Post Office Protocol 3) or IMAP (Internet Message Access Protocol). So to summarize, you send using an SMTP configured mail server, and receive using either a POP3 or IMAP server. These can be separate servers or hosted on the same hardware. An Authentication server is usually an application running on a server, Active Directory for example. This internet or network appliance handles authentication by providing a user or device access to designated resources on the network as determined by the administrator. 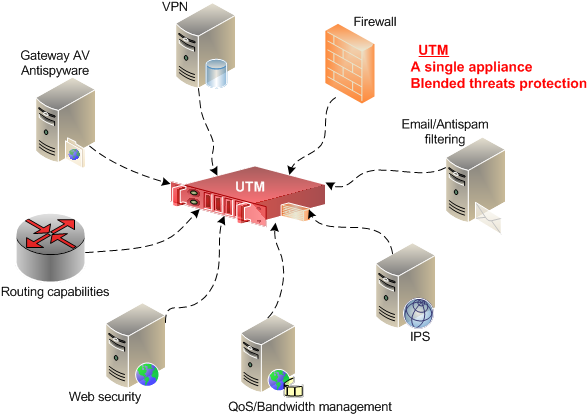 The Unified Threat Management (UTM ) is a way to reduce cost and administrative overhead by combining multiple security features like a router, firewall, content filters, and more into a single hardware appliance with the capabilities to protect the network from unwanted or malicious traffic. It is generally positioned between the internet and the protected network. Here is a look at some of the possible elements. The Intrusion Detection System (IDS) is one of the earliest network intrusion monitoring devices. Often found as a feature of a UTM, router or server. It comes in two primary configuration either as a network based NIDS that will monitor an entire network or as a Host based solution HIDS when Induvial workstations can have this capability. It signals an alarm when suspicious activity is detected. This solution lacks the capability to block traffic. An Intrusion Protection System (IPS) takes the IDS concept and evolves it to detect an alert condition before it enters the network and drop or block the connection. This is an effective approach but it is not a cause to discontinue IDS. The IPS is vulnerable to encrypted network traffic making your solution optimally a layered approach as opposed to “either or”. When considering network servers devices realize that you will encounter networks that are comprised of a mix of new(er) and legacy (=old) hardware. A single computer hosting multiple services like file and print or web and email is not uncommon. Also you will encounter services that are embedded in the firmware many routers particularly the consumer grade or SOHO designs have services like DHCP and/or Proxy servers built in.